Our living room renovation is underway. 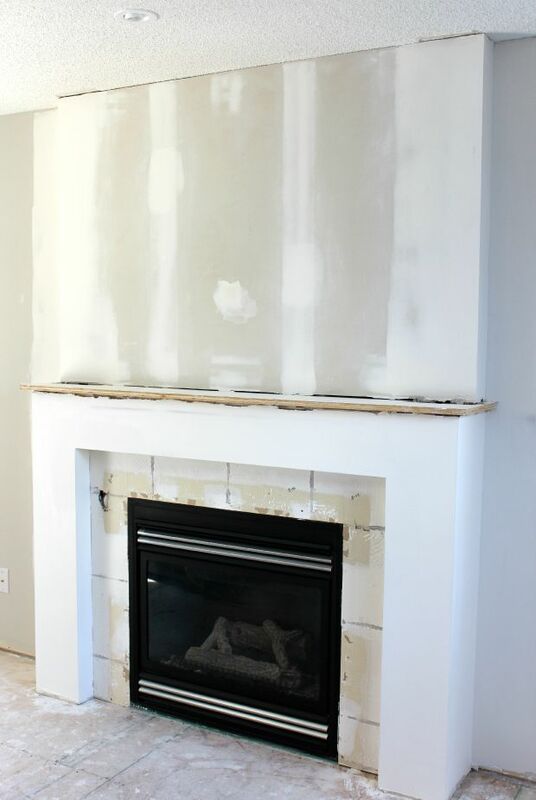 Check out the progress we have made on our fireplace makeover so far, as well as some beautiful fireplaces we’re using as inspiration. Hello everyone! It’s the end of July (yikes!) and, yes, we’re redoing our fireplace. 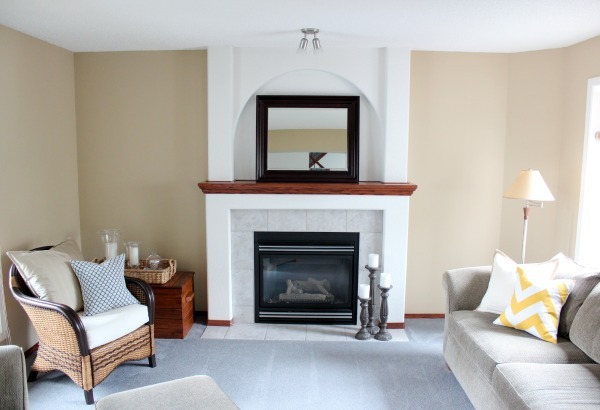 Why a fireplace makeover in the summer? Well, as some of you know, we’re undergoing an entire main floor renovation. It’s dusty, it’s messy, and it’s a huge pain. At times I feel like I’m about to lose my mind (ask my family), but the idea is to rip the bandaid off and get it all done at once. That way, we’ll have a beautifully finished space that we can simply enjoy. 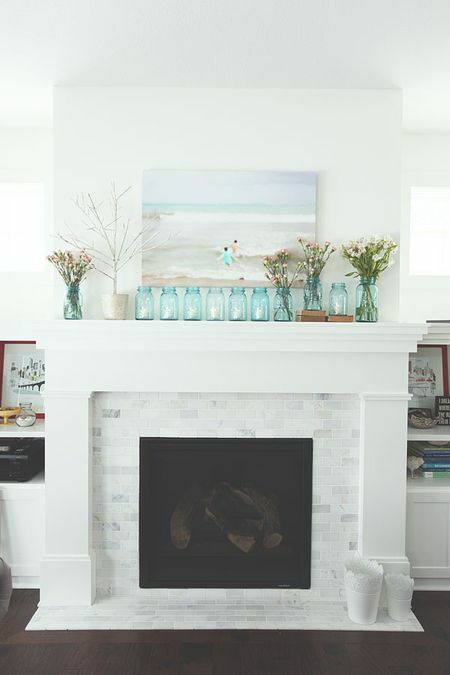 And this white painted fireplace spotted on Better Homes & Gardens. Do you have a favourite in the bunch? We plan on incorporating elements from each one. You may recall this BEFORE photo I posted last summer with the not-so-beautiful red oak mantel and trim, not to mention that dated arch. To get us by for a bit longer, I got rid of the red oak by painting it out in Benjamin Moore’s White Dove. We also ripped out the blue-grey carpet and freshened up the walls in Baby Fawn. It was a good start, but I still couldn’t look past the arch, textured surface and boring tile, especially when I looked close up. So, we reworked the fireplace by pushing back the columns on the sides of the upper section. We also got rid of the arch by covering the whole thing in drywall. The bottom rounded corners were squared off with drywall, too, and the builder basic tile went bye-bye. There’s still a bit more mudding and sanding to do, but I think you can see the direction we’re heading in. 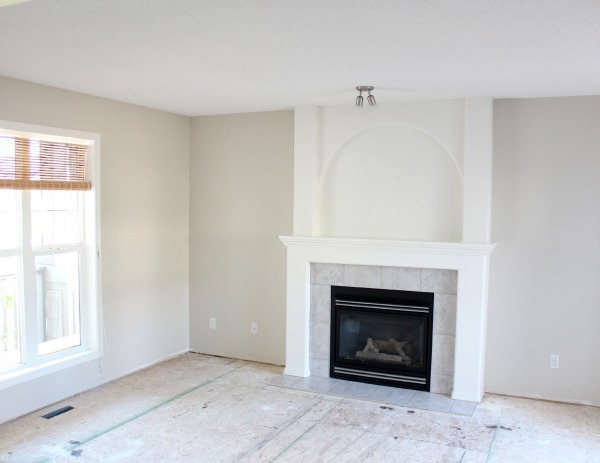 The plan is to trim the fireplace in a combination of flat stock MDF and simple decorative mouldings, then prime and paint the whole thing white. I’m 99% sure the surround will be finished in a marble subway tile to keep it looking fresh, while adding a bit of character. Can you envision it? That’s all I have for you today. Hopefully we’ll get more accomplished over the next week so I can show you an update. 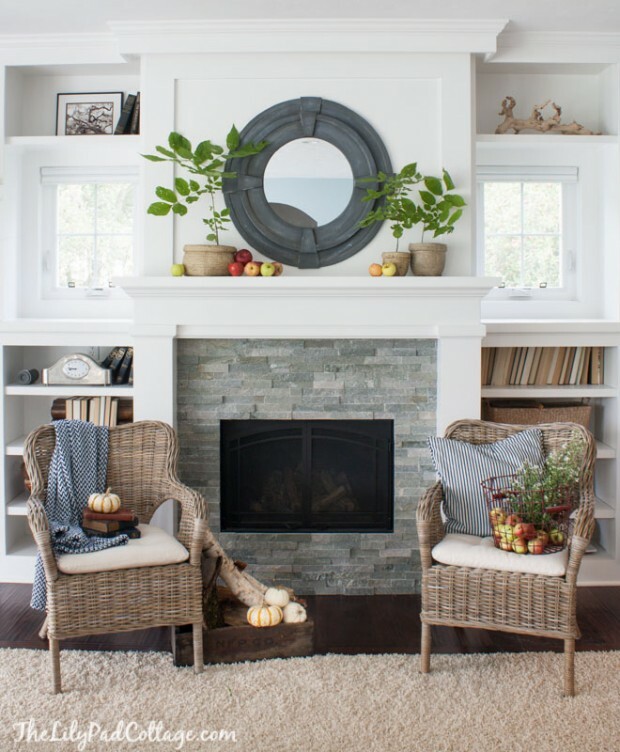 At this rate, our fireplace should be ready for when the cold weather hits (if we’re lucky!). 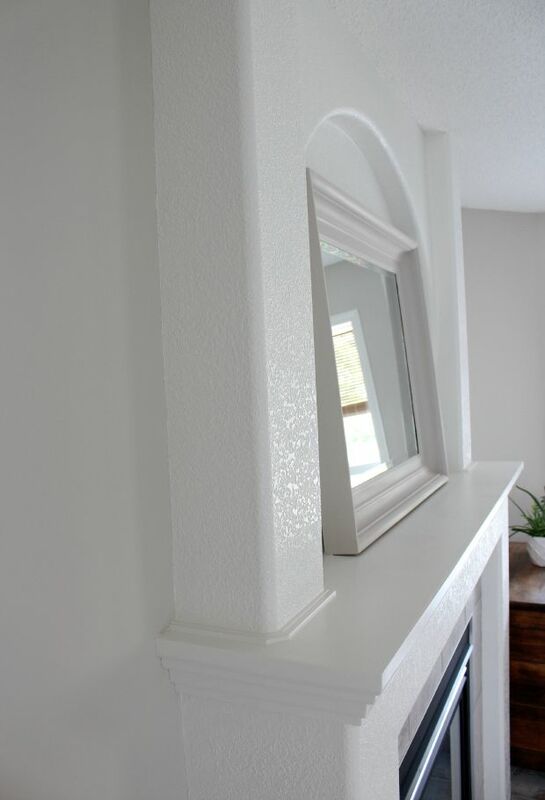 UPDATE: See our finished fireplace! Beautiful job! What kind of wood floors did you use with the fireplace? (The flooring details are in the comments below that post). I love love the way your fireplace turned out. I want to update ours as well. My question is: Can you put that tile over brick? (red outdated brick is what I have) I ve heard you could use a product call thinset 1st? Ive also considered white washing the brick, but I like the look of your better. Thank you for your kind words! I’m not too sure if you can go right over brick. A professional tile setter will know. You may have to install some sort of backer board or membrane first. As well, is your fireplace gas or wood burning? If it’s wood, make sure you seal the marble and I’d suggest doing one full piece/slab at the bottom so grout lines don’t get dirty. Ours is gas and it’s held up great.